The ROHO® PRODIGY® Mattress Overlay System is a non-powered, air-filled, adjustable, reactive, full support surface recommended for individuals who may require skin/soft tissue and/or deep tissue injury protection. The PRODIGY Mattress Overlay System is intended to be used on top of a standard hospital, nursing home, home care, or consumer foam mattress. It is not intended to replace an existing bed mattresses. 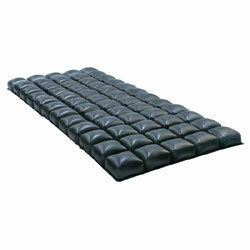 The PRODIGY® is a zoned overlay with a weight limit of 300 pounds (136 kg). Full system size is 35.5" x 81.5"